What is the Best Media Player for Mac? The quality of media players is a heavily debated subject on every operating system. For some reason, every self-respecting media junkie will have a moment where they will consider what the best option is for them. If you are a Mac user, look no further as we present our top five selection of Mac OS X media players. ITunes should need no introduction here, as it is the default media player on any Mac device. Most users that used iTunes on their Windows machines will probably immediately look for an alternative as for them iTunes is synonymous with the term ‘resource hog’. However, this is not necessarily the case on Mac. 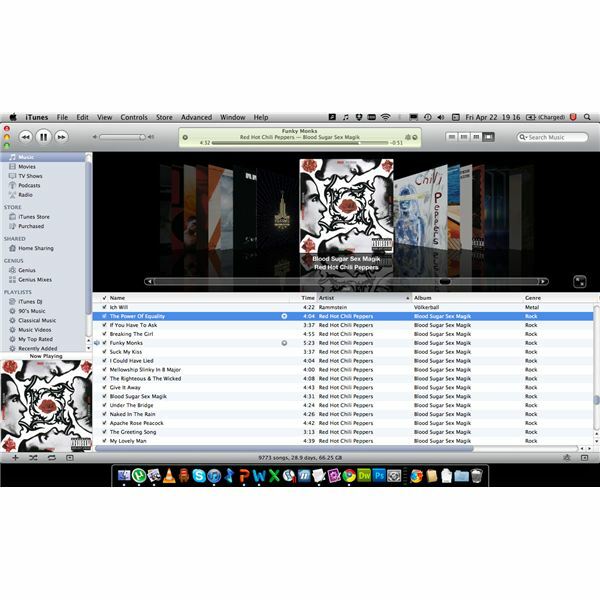 ITunes is originally designed for Mac, which shows. In fact iTunes for Mac is a highly advisable OS X Media player and probably the best choice on the platform if you work with large media libraries. The player supports music and video playback, although QuickTime will be the default video player on Mac. For those that like a minimalistic approach, iTunes will not be the obvious choice. 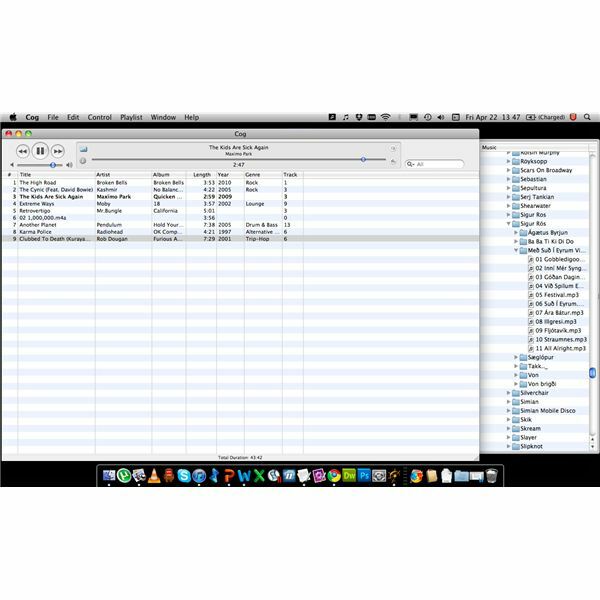 However, for those with a large database of media to manage, there is probably nothing better available on the Mac platform. Songbird is the Swiss Army knife of media players on Mac, in that it tries to cram as many features as possible in a single application. The app is so feature-rich that minimalists should not read any further at this stage. Songbird includes a full-fledged media player with a built-in browser as well. As it is based on Mozilla’s XULRunner and GStreamer Media framework, it is sometimes referred to as the ‘Firefox of media players’. A more concrete inheritance is shown in the plugin support, which includes a large variety of Internet music services. The application has also released an Android application with which it can synchronize. All these features make the application quite the resource hog and can slow your Mac machine down if you do not supply adequate amounts of RAM. However, the upcoming 2.0 release promises improvements. Note. When Songbird gets updated to version 2.0 this article will be updated to reflect any changes/improvements. As with iTunes, it is unlikely that VLC needs too much introduction as a free media player on Mac OS X. Although VLC is largely intended as a video player, many use it for music management as well. There are a number of standout features that define VLC, which made it the default media player for many Mac (and other platform) users. The most compelling reason to use VLC is for its support for a large variety of file formats, and its support for video formats has made many codec-packs or plugins redundant. Add to this that VLC is open-source, skinable and above all a very lightweight application for your Mac makes it a strong player in this list of best OS X media players. 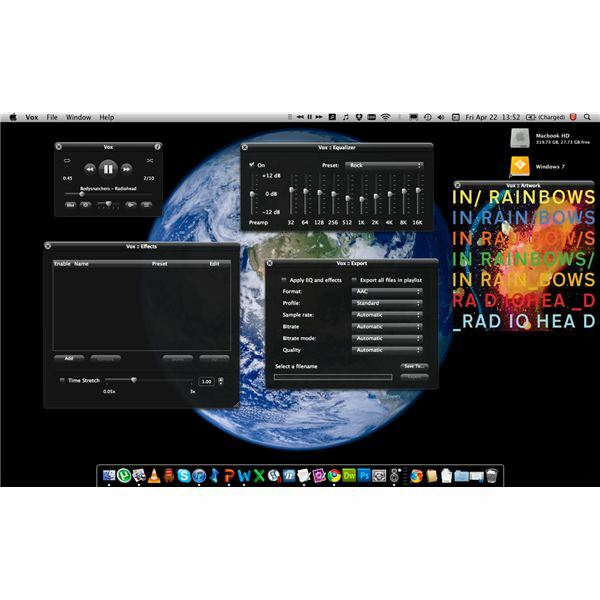 Cog is a music player for OS X with no video support. Although this may seem as crippling the software, Cog is outstanding in what it does and will appeal to minimalists. Its simple to use, drag-and-drop, approach will be a revelation for those that are repelled by iTunes’ and Songbird’s feature-packed offering. Cog’s interface has really been kept to a bare minimum with a single pane music control and playlist view as the HQ of the application. Songs can be dropped in the playlist from the finder window or from its separate folder pane that can be extended on the right side of the app. Cog supports an incredible range of audio formats and will probably play anything your throw at it. Cog is truly the perfect music application on OS X for minimalist purists. Like Cog, Vox also presents itself as a lightweight alternative music player for OS X. Besides the fact that Vox also supports a large variety of music formats and has no video support, similarities sort of stop. Vox takes an entirely different approach to minimalism, one that is not necessarily that minimalistic at all in the end. When Vox is opened for the first time a tiny window appears with only the basic music controls on it. However, just like with Winamp on Windows, the real features are hidden throughout different windows that can be opened through buttons on the control window. This opens a variety of options, such as an equalizer, an effect window, an export window and a box that shows the artwork of the currently playing song. Indeed, Vox is not very processor or RAM intensive and a perfect mix for those that want a minimalistic approach with features. All the various media applications discussed here all have something that makes them unique in their kind. The best media player on OS X therefore does not exist and makes it entirely up to your own needs to determine the preferred option. If you want a media player that manages both music and video, Vox and Cog are not for you. However, if minimalism is a precondition iTunes and Songbird will not make it onto your shortlist. Whatever your preferred choice is, this list goes to show that Mac OS X user do have quite a lot to chose from in terms of media management. Whichever application you will end up with, there is not really a bad option here as your precious media collection is in good hands with any of them! Note. If after reading this article you see that your favorite Mac OS X media player was not named, feel free to drop your preference in the comments box for other readers to discover!